Our technology highly tested in a great variety of applications, the extrusion line supplies a finished product which, through fully computerized process control, reaches levels of complete uniformity and quality as regards to width, thickness, weight, camber, breaking loads, elongations under load, weld ability and resistance to abrasion. The Pet and PP straps produced on our lines are replacing steel straps at significant savings. Our extrusion line is the most flexible strap making line, at the vanguard of the world market, and no doubt meeting the most sophisticated requirements of all customers. We are manufacturer of prime quality of PP Strapping rolls that excel in quality and is manufactured by using high grade material supplied by renowned manufacturers. 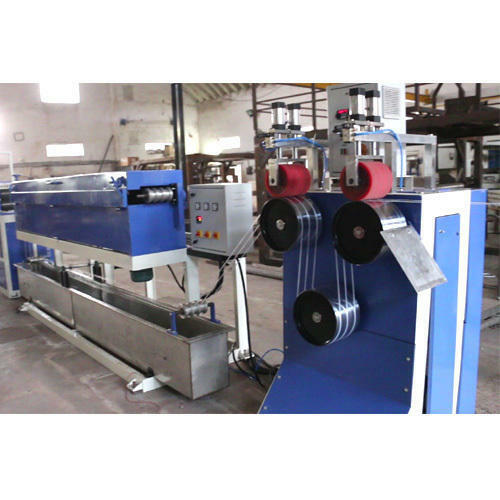 PP strapping rolls are suitable for semi automatic heat sealing machines and for manual strapping. We are leading manufacturers, suppliers and exporters of PP Strapping rolls from India. To meet the varied packaging application of our diverse clients from various industrial background we manufacture high quality and durable pp strapping rolls straps that can be used effectively for versatile packaging purposes. PP straping rolls are available in a variety of thicknesses and widths to suit the needs and requirements of our esteemed clients.We also manufacture PP straping rolls in different colors as per the need of our clients. We are offering PP Strapping Roll to our valuable clients globally as its exported after stringent quality testing. PP HDPE BOX STRAPPING MACHINE PLASTIC PP Box Strapping Plant, PP Box Strap Machine, PP Strap Line, PP Strapping Plant, PP Strapping Production Line.